We travel to learn and sometimes, unlearn. We travel to open the doors to the unknown and cherish the known. There are explorations that we undertake to know a region well, to get acquainted with a different culture, to meet people, to gorge on delectable food. Then there are explorations that revolve around unearthing the absolute unknown. To have conversations with inanimate objects, to personify them and bring them to life. To dig out stories behind these inanimate objects and study the life around them. What kind of journey is this, you may think, and what are these inanimate objects? If you have been following my blog, you know that one of my most favourite photographic themes are doors. And this journey is about them. #DoorsOfIndia is a campaign by Tata Pravesh which documents the iconic doors of India across states. Last month, I spent close to 10 days exploring the doors of a region, known for its architectural splendour and rich heritage. A zone that has temples as old as 6th century and remnants of that era that can leave anyone spellbound. If I started counting the temples in Kanchipuram, I’d lose count within seconds. And if I started counting their pretty doors, I’d give up on the whole idea. As I enter the first Gopuram of the 6th century Ekambareshwarar temple, a wave of nostalgia hits me. The familiar sights of massive colourful rangolis greet me and I scurry past those carved pillars to reach the inner sanctum. Nothing seems changed. Definitely not the calm. It is 12 pm and devotees trickle out slowly through the magnificent mango coloured door which is slowly shut by the priests. I am now left face to face with it as it silently guards the world behind it. I saw this 1300 year old door as a guardian to tangible Dravidian architecture and intangible, terrific energy. The sounds of mridangam welcome me as I step into another fantasy in stone in Kanchi: The Varadharaja Perumal temple built in the 10th century. The giant door at the entrance made me stop in my tracks and gaze up till my neck craned. This sheer beauty stood tall and strong, witness to so many devotees entering, exiting, praying, hoping, promising , requesting. I am lucky to witness one procession where the idol is brought out by the priests and there is a celebration like none other. There is music, classical traditional music, reiterating my belief that India is truly a land of cultures. It is time to bid adieu to the land of a 1000 temples and move to the next destination. Pondicherry: A little bit of French, A little bit of Tamil. Red, yellow, pink, green, peach, auburn, cherry, tangerine..the list is endless. But Pondy has it all. With colours splashed on its streets and serenity breathing down its lanes, Pondicherry is a delight for architecture buffs. Why should doors have all the fun? I sprint down its streets, reminiscing my first ever solo trip, but today its not about the cafes, or the beach. It is about doors and like always, Pondy doesn’t disappoint. I walk into the Cluny embroidery centre and the quiet is addictive. Smiling women work untiringly behind tall, colonial style doors. To an unsuspecting passerby, this might seem a private colonial styled villa, but behind the doors, these women weave not just gorgeous embroidery but their destinies. If you ever happen to visit Pondy, do pay a visit to these cheerful women and meet the very sweet Sister Augusta who is in charge. While the French quarters are much spoken about, the Tamil quarters have their quintessential touch to add too. I enter the Tamil styled door of the Intach heritage centre to find how several mansions in Pondicherry were restored and brought back to life by this organisation who works to save architecture heritage. Pondicherriness is addictive. It sure is! Day 4: A new day. new destination: Trichy. I am super excited. It is a door that I have heard so much about. Read so much about. A colourful door that lakhs throng because it is believed to lead one to salvation. Unbelievable, right? India surprises me sometimes. We instil our beliefs in inanimate objects and bring them to life. Be it idols or doors. And faith can move mountains, isn’t it? The story of this celestial doorway will surprise you as well. Have a look. With just about six hours in Trichy, I leave with a heavy heart, but there are more doors to open! Known primarily for the Meenakshi temple (which I did visit), the city also has the lesser known Thirumalai Nayakar palace. Remember Manisha Koirala dancing amidst the tall pillars in the song Kehna Hi kya? The entrance to this marvel is a simple, elegant door. The grandeur of this palace cannot be put in words. A sheer architectural marvel, the palace is a melange of various architectural styles: Dravidian, Islamic, European. History can never fail to astound you. All we need to do is go past that stunning door and be lost in a forgotten era. Mansions and more: Karaikudi, Chettinad. Homes and memories go hand in hand, don’t they. We can be attached to a house for the memories it beholds. The secrets, the laughter and all those moments of joy and togetherness. In Karaikudi, I visited one such home. A typical Chettinad mansion with gorgeous wooden pillars, pretty tiles, massive courtyards and intricately carved Burma teak doors. The door of the MS house, told enchanting tales while I struggled to open the gigantic iron lock. Have a look at the story of this door, seeped in history and memories. This was the last stop and little did I know that I would find a storyteller tucked away in a tiny village near Tirunelveli. A carved door with 80 stories imprinted on it from Indian mythology stands at the entrance of a lesser known Shiva temple built over a thousand years ago. The door stood like a preface to a rare, forgotten novel waiting for interested readers to flip open pages of history. I have always believed that doors are stories in themselves and more than mere pretty frames. And this journey reinstated my belief. Through this I could traverse through timeless stories of faith, beauty, strength, inspiration and marvel (yet again) at the forgotten, glorious heritage of my country. Doors of India has made me fall in love with doors yet again and helped me showcase their beauty not just in words and photographs but through powerful videos. SO next time you pass one of these, pause and converse with these remnants of the past. They might narrate a story you have never heard and turn you into a storyteller too. A story that will be beyond their beauty and strength. A story that will run deeper though the pages of time with unspoken memories, buried over centuries. P.S: I have a huge list of thank yous to dish out in this journey. To Tata Pravesh, JWT and Hungama Digital Services to help scores of Indians value doors and heritage of their country by means of this campaign. To all those people on ground who helped us with information, permissions and graciously welcomed us into their homes, spaces and hearts. The priests at the temples of Kanchi, Mr. Ashok Panda and Vijay of Intach Pondicherry, Sister Augusta of Cluny Embroidery centre, Mrs. Meiyappan of the Bangala for being a darling and Krishna and Prabhu for ferrying us in their Innovas. To Sonam and (Inder: for being the bridge) for last minute make up tutorials and to Mahi for incessantly teaching me hairstyles before the trip. Lastly to all those who showered their love on social media and egged me on with their encouraging words. The journey isn’t over. 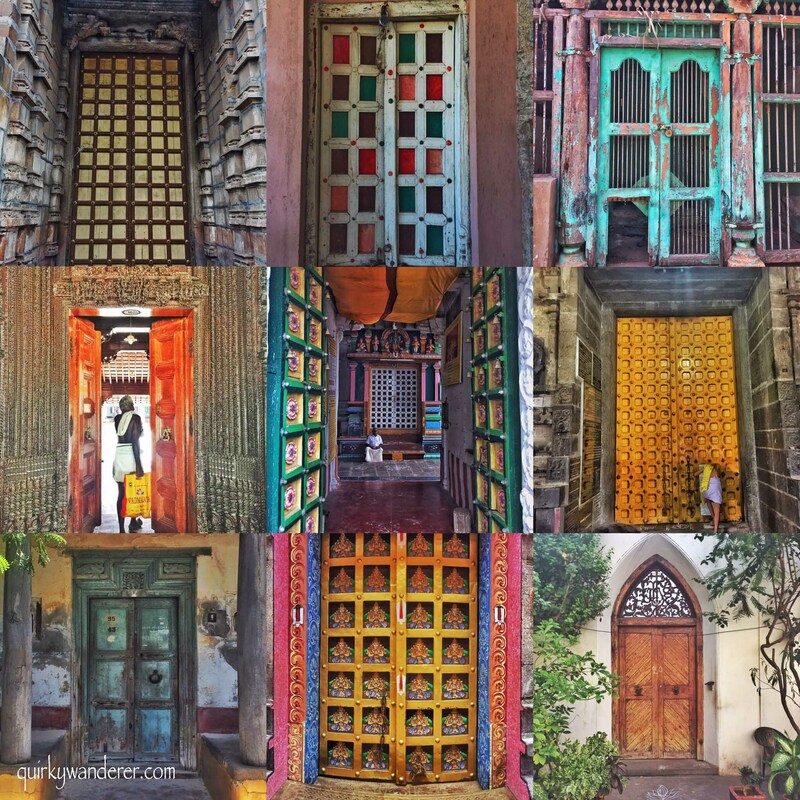 Follow #DoorsOfIndia as travel bloggers like me unearth Door stories in other zones till October. What a visual treat this is Divsi and you know why I am writing a reply! Did you get enough dope of doors for the life time ? Or atleast for this year? Wonderful write up and I am so happy that you have done this project. Great work Divsi. Proud of you. What a great and unique project! Beautiful photos. I love the colors. Wow, wow, wow!!! What a spectacular array of doors and what an incredible journey! A visual treat and a beautiful journey sprinkled with stories and history. Massive, majestic, quaint, quirky…name it and you’ve covered every kind of door in this post. Loved the video snippets and interesting background stories. You did it girl, and did it so well! Love this! Drooling over those doors. You’ve captured them beautifully. Doors have always fascinated us not only with their beauty but also the mysteries they hold! This is a wonderful series where you unlock secrets of these ancient doors.. Brilliant photography. Thanks for the video. Oh wow. Those certainly are stunning doors. I love the bright colours in them. A very interesting post with wonderful pics! I must congratulate you first for being a part of this great campaign. I wish I could be a part of this trip because I could never explore South India in an extensive manner, even when I was living down south. Every square inch of these walls and pillars tell a story! Oh my gosh! What a beautiful photo essay! I’m heading to India early next year and I can’t wait to check out all the amazing doors that I come across! What a brilliant read, enjoyed the video series as well the write up to the tee 👏💖😊 You have personified the doors is this unique campaign and I am intrigued knowing about them. This is such an awesome project. That mango colored door is the most interesting one for me. Is the 3500 year old mango tree still inside the compound? What a beautiful collection of doors you saw over the 10 days! I am also a fan of intricate doors and like to think about their stories. I love how colourful the Pondy doors are. I think I like the doors and frescos in Trichy the most, especially the colourful doorway to heaven! Madurai Palace is breathtaking. Thank you for the wonderful tour! What a fabulous post! Doors fascinate me too, and I cannot resist pictures of doors. You have such a great collection here. Rajasthan doors are my fave because of their intricate and elaborate carvings. Unfortunately, today doors have lost their artistic look and like everything else, have become more functional than creative. I love doors from around the world too! People can be so creative and there are some really cool doors out there. Your photos in this post are gorgeous–so many great doors! I really like the intricate designs at the temples, especially the Ranganathaswamy temple. Fun to get a look into the doors of India! So good to see these finally. I’ve heard much about it in the making, and it looks as good as you said it was. Beautiful collection of doors – intricate designs and carvings, lovely colour combinations! They all seem to tell a story of their own. I love the images of the doors!!! Love these door pictures. Each one is a work of art! Love this post and the door photos, especially the rustic ones. I’m a collector of door photos, too! This piece of writing was an awesome read! Those doors are truly awe-inspiring that I can’t stop looking at your pictures! How long did this journey take you? Amazing photos and writing. Loved reading through. beautiful pictures. they say the story themselves. keep travelling and keep sharing.